Sometimes you just want a bit of chocolate. And quick. That's when you make these simple, no bake Triple C Bars. C is for cereal (two kinds actually). C is for (dried) cranberries. And C is for...chocolate, of course. There's also some peanut butter, because chocolate and peanut butter is one of my all-time favourite combinations. These bars are vegan and can be made gluten-free by using gluten-free cereals. 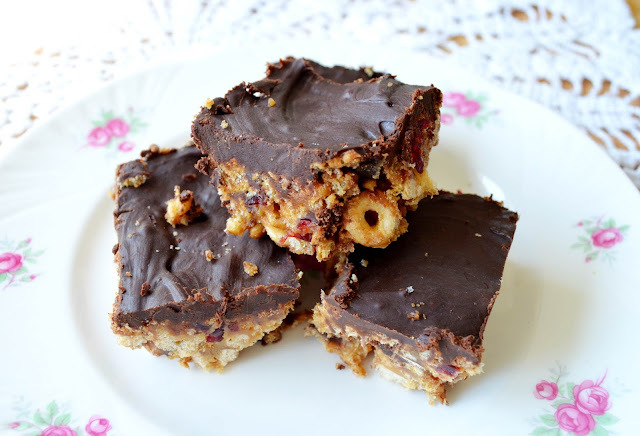 These bars are also great if you have cereal to use up. I bought three boxes of brown rice crisps for some reason. They are all expiring in late August. We (mostly I) will be eating several variations of these bars in the days to come. While watching Breaking Bad. Who else loves that (slightly nauseating) show? These puppies are on the sweet side. Rarely a problem for me, but I'm told some people don't like sweets. Crazy people. Whip these up right now. Eat one. Then eat another one. And so on. They are surprisingly addictive. Line an 8" square baking pan with parchment paper cut to size. In a large bowl, stir together the cereals, dried cranberries and chocolate chips. In a small pot over medium heat, stir together the peanut butter, agave nectar and vanilla until melted and smooth. Pour over cereal mixture and stir until well mixed. Pour into the prepared pan and press the mixture down with the back of a spoon. Place a stainless steel bowl over a pot of boiling water (or use a double boiler) and add the chocolate chips and non-dairy milk. Stir until the icing is smooth. Pour icing over squares and spread it evenly. Refrigerate until chocolate sets. Enjoy! We'll be tuning in to Breaking Bad tonight too! Breaking Bad is no doubt going to be exciting!! These look delicious Joann! I would love to eat up one right now! We are all Breaking Bad fans at our house! We watched tonight's episode and it got into the conflict with the brothers-in-law really quickly, didn't it? I wish you were here to share the goodies with Angie! They look yummy! Craving and craving and craving again!! Oh I like Breaking Bad!! If I made these I know I'd eat it all on my own. They look great :) I've never watched Breaking Bad though I've borrowed the DVDs from my sister and meant to start watching yesterday. I'll start tonight, hopefully. I ate quite a few my friend! I so many loves this!! Brilliant way to use up cereal scraps. Printing it up directly & slapping it on my fridge!